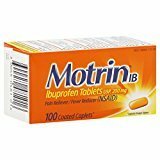 Motrin IB Ibuprofen Tablet is physician recommended pain reliever available from Amazon online shopping in Pakistan. It is used for temporarily relieving headache, menstrual cramps, arthritis pain, toothache, backache, etc. It effectively reduces the fever. One pack contains 100 caplets. Ask your doctor to prescribe it and consult him in case of any side effect. Legal Disclaimer: IN NO EVENT, REGARDLESS OF CAUSE, SHALL ALL STAR SALES BE LIABLE FOR ANY INDIRECT, SPECIAL, INCIDENTAL, PUNITIVE OR CONSEQUENTIAL DAMAGES OF ANY KIND, WHETHER ARISING UNDER BREACH OF CONTRACT, TORT (INCLUDING NEGLIGENCE), STRICT LIABILITY OR OTHERWISE, AND WHETHER BASED ON THIS AGREEMENT OR OTHERWISE, EVEN IF ADVISED OF THE POSSIBILITY OF SUCH DAMAGES.